Once upon a time there was a sub-genre of movies called Spaghetti Westerns. They were Western movies that were produced by Italians, making them look and feel different from your more traditional Westerns. Old Town Scottsdale is kind of set up to look like the old west. 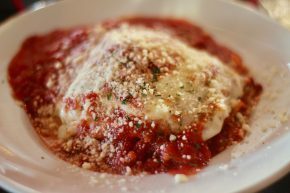 And in Old Town Scottsdale is an old school Italian place called Italian Grotto. It’s like spaghetti in the west, but there is good, bad and ugly about it.